2014 is nearly over, with a mere three days left in the year before 2015 starts. I thought I’d take this time to look back on my year, with another post tomorrow talking about what I plan to do next year (which will be the special announcements post I mentioned a while ago). 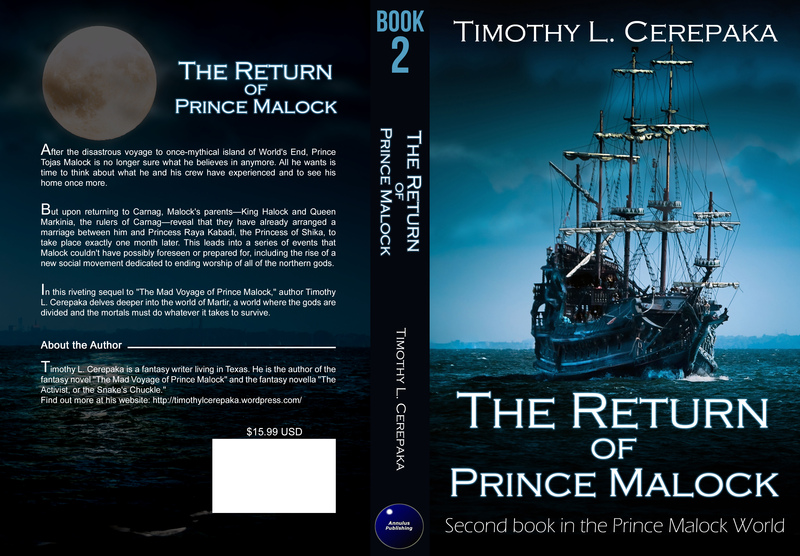 Book Four in my Prince Malock World fantasy series, The Coronation of Prince Malock, is set for release later this month or early December, depending on how fast things go. As a result, I’ve had to write up a good sales blurb to be used on its production description pages to get readers to buy it. But I’m just not sure if this blurb is as interesting as I think it is. Therefore, I’m posting it here for y’all to comment on and tell me what you think. I will take ALL suggestions into account as long when I revise this blurb (as long as they aren’t spammy or anything, obviously). “With the unexpected death of his father the king, Prince Tojas Malock of Carnag is forced to don the mantle of King of Carnag amid persistent rumors of the corruption of his friend, Skimif, who recently took on the role of God of Martir. Even as Malock fights to keep Carnag from joining the ever-growing coalition of Northern nations that are against Skimif’s rule, doubt gnaws at the back of his mind, causing him to wonder just how righteous his old friend really is. What do you think? Good? Bad? Interesting? Boring? Maybe needs a couple of tweaks here and there? Throw it out and try again? If you would like to be the first to know about the release of The Coronation of Prince Malock, you can sign up for my newsletter by clicking HERE. I will only send you emails regarding my new releases, never give your information to anyone, and you can unsubscribe whenever you want. Buy my three ebooks at 25% off each through DriveThruFiction’s Christmas in July Sale! For this week only, the ebook website DriveThruFiction has over 3,000 ebooks 25% off, including my three ebooks, The Mad Voyage of Prince Malock (normally $7.99, this week $5.99), The Activist, or the Snake’s Chuckle (normally $4.99, this week $3.74), and The Activist, or the Snake’s Chuckle: A fantasy collection (normally $5.99, this week $4.49). This is a great way to check out my work while getting a great deal, too. Buy them today! 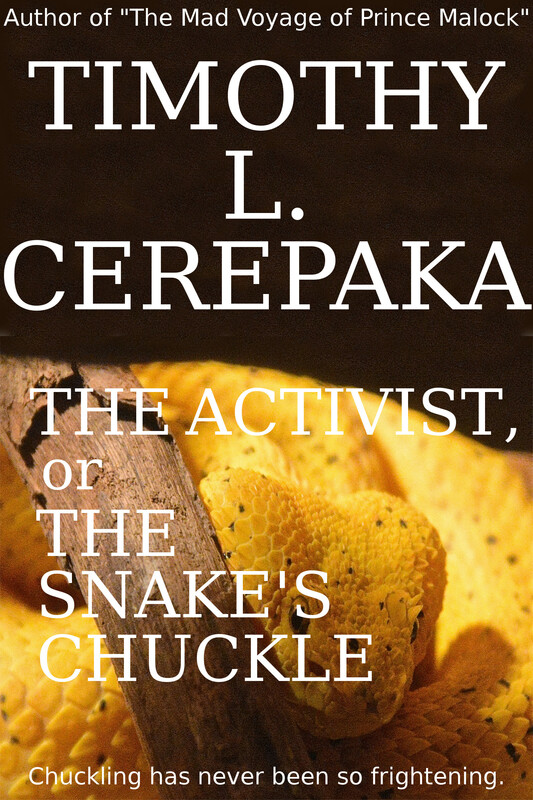 Two new ebooks: “The Activist, or the Snake’s Chuckle” and “The Activist, or the Snake’s Chuckle: A fantasy collection” are now available! Hey everyone. Just blogging here to announce the release of my two newest ebooks: A fantasy novella called “The Activist, or the Snake’s Chuckle,” and a fantasy collection called “The Activist, or the Snake’s Chuckle: A fantasy collection,” which, in addition to having that novella, also has four short stories in it by yours truly. When Koromo Samver, leader of the spiritual/social movement known as the World Activists, receives a letter from her old mentor, Mother Dimina, summoning her back to the Mountain Monastery, she answers it without believing much will come of it. As it turns out, the Mountain Monastery is under attack by Lord Skamva and his Trinity, a group of demons thought to have been banished three hundred years ago. Even worse, a terrible skin disease–one which drives the infected insane and often leads to suicide–has spread throughout the Order of the Monks, infecting almost all of the Monks, including Mother Dimina herself. And when Koromo herself comes down with the disease, she must race against time to find the cure for the disease and stop the demons before they succeed in destroying the Monastery. Because if she fails to stop the demons, then not only will the Order fall, but the rest of the World as well. In “The Activist, or the Snake’s Chuckle,” the first and longest story of this fantastic collection, Koromo Samver, leader of the spiritual/social movement known as the World Activists, receives a letter from her old mentor, Mother Dimina, summoning her back to the Mountain Monastery, which she answers it without believing much will come of it. worse, a terrible skin disease–one which drives the infected insane and often leads to suicide–has spread throughout the Order of the Monks, infecting almost all of the Monks, including Mother Dimina herself. In the second story, “The Creator’s Dilemma,” the being called Listener must help his master, the engimatic deity known as the Creator, decide the fate of a woman’s life. When the Creator confesses his love for the woman, however, Listener realizes the situation is far more complicated than it first seemed. The third story, “The Most Beautiful Island in the World,” features Igici, the King of the Island of Niji, as he works tirelessly to save his people. But after one too many failed schemes on Igici’s part, his friend Gikil is no longer sure she wants to support him. In the fourth tale, “Not Malicious. Jusy Unlucky,” Alica Onok finds herself alone with the strangest toy fox terrier she has ever met. He claims to be an unlucky spirit named Ginor, but can Alica trust him? And just where did he come from, anyway? And finally, the collection concludes with the fifth and final story, “The Gift of Valgink.” In this tale, the human slave Desdar and his elvish mistress Kencha are trapped by a tribe of smoke wolves, who claim that Kencha stole their most precious treasure. Will Desdar and Kencha escape alive or are they destined to be little more than fresh meat for the wolves? A print version will come out sometime later. If you want to be the first to know about it, then you can sign up to my mailing list here. 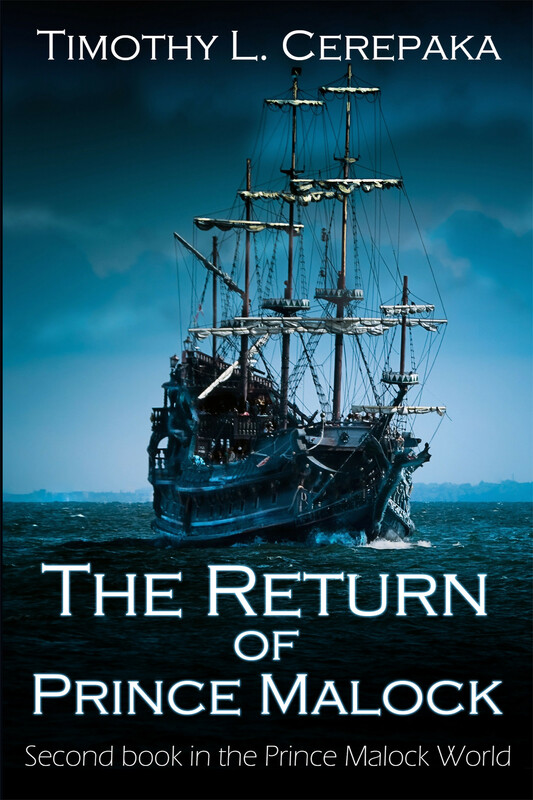 Today I finished the third draft of my upcoming novel, The Mad Voyage of Prince Malock. I am done rewriting or, as some writers call it, ‘redrafting.’ I will put it aside for now, work on a few short stories, and then come back to it to do some editing. I could do the editing right away, as I know of several problems that need to be addressed, but this draft was a lot harder for me to write than the last two and I would like to focus on something else for a while, just to give my mind a break. After I edit out those errors, I will then give it to some friends of mine to look over. And after that, I will get it ready for publishing, which should be sometime later this year if all goes according to plan. So excited.